Whether you've sewn before or have never picked up a needle, yes, you can use this book! This how-to-sew book for girls contains fully-illustrated sewing lessons for 16 different homemaking and gift projects. Each of the lovely and practical projects is labelled to indicate the difficulty level: beginner, intermediate, or advanced. Designed for beginners, and flexible enough to be used individually or with a group or co-op. A sewing machine is helpful, but not required. Glossary included. Most projects can be completed by children eight years and older. However, some of the lessons can be practiced by girls as young as four or five. Patterns included. Sixteen sewing projects including Hair Scrunchies, Baby Blanket, Eyelet Pillowcase, Apron, Home Altar Cloths, Lap Quilt, and more! Extra: Enjoy historical features such as "Pins and Needles," "A Bit about the Humble Apron," "History of Quilting," and others. 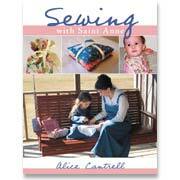 Start your own Sewing Circle with Sewing with Saint Anne! The projects are great group activities for your co-op or girls' club. Softcover. 109 pgs. 8½"x11" Spiral-bound for ease of use.